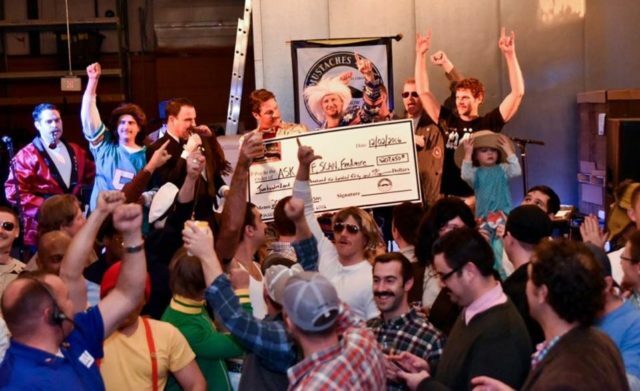 Local growers celebrate the fundraising success of Mustaches for Kids at Hardywood Brewery. M4K Richmond kicks off its 2018 season of growing tonight at Vasen Brewing Company! More than a decade ago, local environmental scientist David Hogan attended a Christmas party in Richmond. While the gathering was typical in many ways, the new father noted something peculiar about many of the guests who were in attendance from out of town. Facial hair. Inspired by what he observed that night, Hogan vowed to do two things: launch a chapter of Mustaches for Kids in Richmond and grow his first mustache. The Richmond chapter, founded by Hogan in 2003, has raised over $100,000 for Richmond area charities, with totals steadily increasing each year. In 2011, M4K Richmond reached its highest target ever, raising $30,000 in just a four-week growing season. In addition, the organization has seen its membership skyrocket to more than 60 participants, also known as growers. Three local children’s charities are the beneficiaries of M4K Richmond’s efforts: SCAN, ASK, and the Children’s Hospital Foundation. Each organization received $10,000 after the 2011 growing season. To its credit, M4K Richmond was the recipient of ASK’s Rising Star Award for the nonprofit’s contribution. The fundraising shout-out was a nice touch, says Hogan, who is president of M4K, but this father of three will tell you the M4K growers are not in it for the awards or the glory. As if proof is required, he shares the founding principles of M4K Richmond: the wish to help children in the local community; the need for camaraderie with fellow growers; and the desire to grow some fabulous facial hair. Aaron Breed, vice president and treasurer of the organization, participated in the very first M4K growing season with Hogan. Growing season begins each November on what is known as “shave day,” when growers gather at a pre-designated local pub and have their pictures taken. From there, the growers solicit donations from friends, family, co-workers, and as Breed says, “anyone else who asks what the heck is on your upper lip.” Growers post picture updates as progress reports on the M4K Richmond website. To foster the camaraderie Hogan noted, growers meet each week to monitor headway, discuss growing techniques, and turn in money raised. Sponsors can also support growers through donations online. Each growing season culminates in the annual Stache Bash where many growers dress in mustache-inspired costumes. 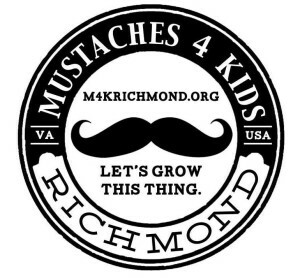 To further inspire growers to greatness, M4K Richmond has introduced competitions like Mustache Feats of Strength. Growers can also vie for internal awards, such as the coveted title of Sweetest ‘Stache. Next articleCan Addiction be Prevented?